If you’re thinking of getting a cat, and can get to Devon, think harder, think faster, and do it by Wednesday. Look, I’m so serious, I’m even linking to the blinkin’ Daily Mail. The Decoy Kitten Rescue in Newton Abbot is closing down and the likes of the RSPCA (who use it as an overspill centre) are obviously too full to take them. I have no idea if anyone’s been on to Cats Protection, but I can’t imagine they’re any less full (they’re brilliant by the way). 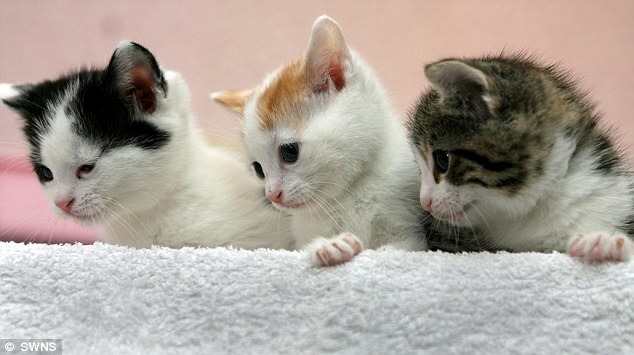 Call 01626 205755 to ask about a kitten – or a cat, for that matter, as there are some adult ones too. I can’t bear to think of them dying while there are homes out there. I’ve begged my husband for one of the kittens, but we’ve already got 4 cats (2 rescue) & he say’s we can’t – I beg people with big hearts in the area (we’re in Norwich) to please please please give a home to a delightful kitten! I adore cats and, even more, kittens, so I’m praying people will help. It breaks my heart & I wish I could do something to help – would a donation help. altho’ it won’t be very much. We’ve got two cats too (see header!) so I couldn’t get one either. Just not enough space. I’m sure if you give the rescue a ring on the number given they’ll be able to let you know if a donation will help keep things going, and if the publicity afforded by the Daily Mail etc helped find the kittens homes. I know how you feel!